Where is it legal for Astronomy and Photography types allowed to group during the night? which is great news, especially with the Summer months coming up! Also check out my recently published 32-page book based on this presentation! 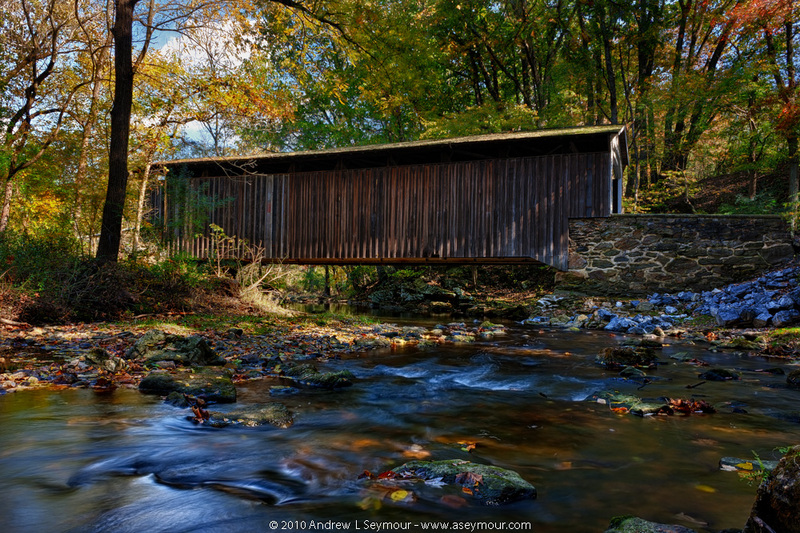 The following is the Talk I gave about the covered bridges in the Oxford area of Chester County, PA. The information on the history of the four bridges was done over the internet, and tries to be as accurate as possible. First, I would like to “Thank” the Folks here at the Oxford Branch of Citadel for hosting tonight’s events, and especially Gwen Smoker for coordinating all the various people. Gwen first contacted me at the beginning of October about this event, and asked if I would be interested in Sharing some of my Covered Bridge images. My immediate response was yes! Over the past several weeks, I’ve been frantically opening two-year-old files, and regenerating new images based on new tools and techniques, gained over hundreds of hours of practice. I have lived in Chester County for over 35 years, and was introduced to photography as a young child, and have carried that interest ever since. Over the years, I have been lucky enough to work in several industries, where I can use my love of photography and technology to their fullest. With the maturing of both computers and cameras, the technology is readily available to use both to enhance what we see in daily life. In my case, I am using a digital photographic technique known as High Dynamic Range Imaging or HDRI or HDR. What this means, is that you take a middle image, and then one overexposed and another one underexposed. Then on the computer, you combine the three images, creating a single file that contains the color range for all three images. From there, there are many different software packages and techniques to create a final image that pushes the boundaries of today’s technology. 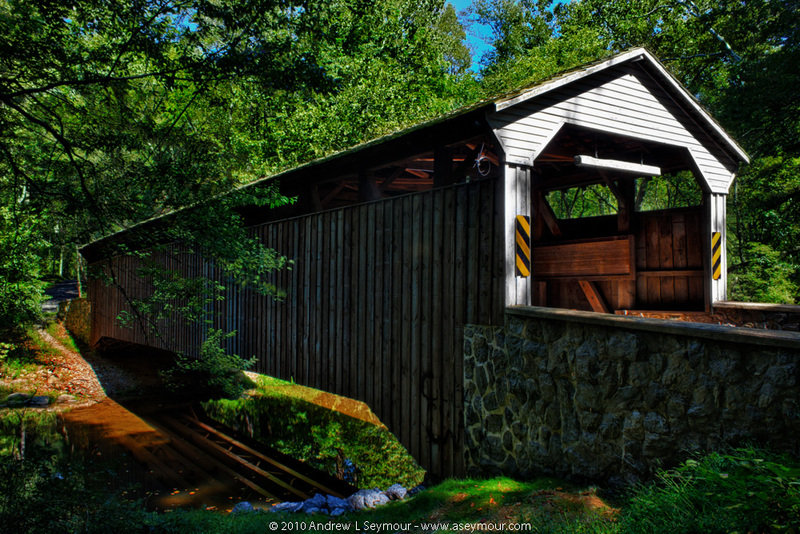 I took my first digital photo of a Bartram covered bridge in Newtown Square, during the early Fall of 2009. 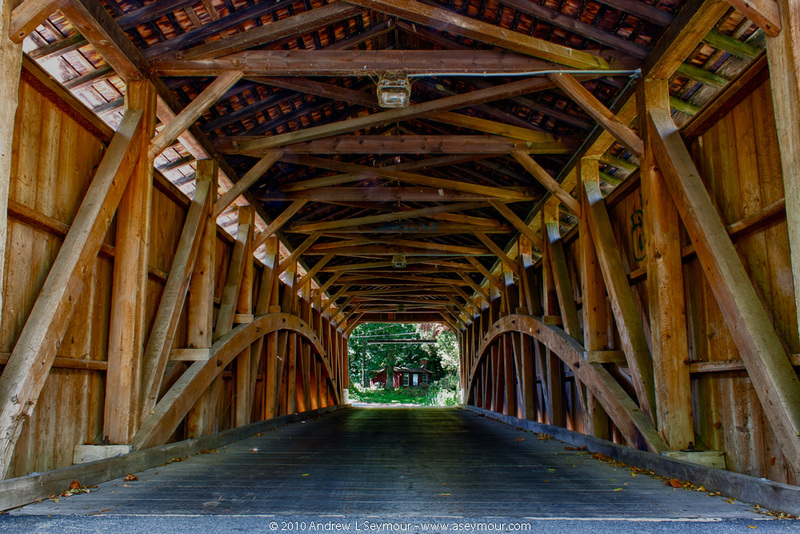 After processing the image, I posted it to my Flickr account for photo sharing and thought nothing more of it, until several months later I got a request to add it to a covered bridge group. Shortly after submitting the image to the group, I began to get some wonderful comments, which only encouraged me to further investigate the other opportunities in Chester County. During the summer and fall of 2010, I lived on Google Earth as I hunted down all the Chester County bridges, and then plugged the coordinates into my car’s GPS device. With all this information, I was able to plan day trips to capture as many bridges as I could in what little free time that I had available to me. 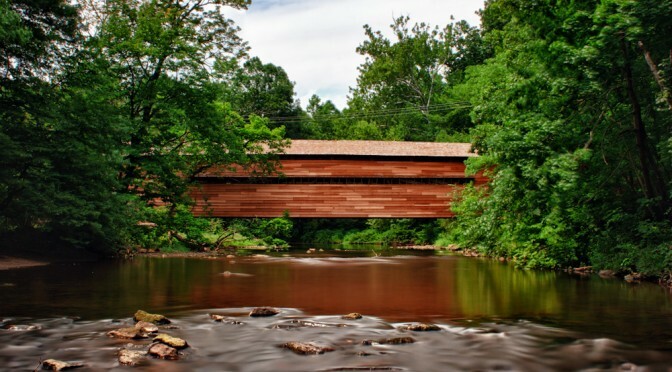 The first covered bridge in Pennsylvania is thought to have been built around 1807, and for the next 92 years, it is believed that there were over 1500 covered Bridges built. Currently, there are about 220 covered bridges still left standing in Pennsylvania, with 15 of them residing in Chester County. Of those 15, three of them are in Elk Township, the smallest Township in Chester County. The first Pine Grove Bridge was built some time in 1816, but was later destroyed by a storm. In 1846, the bridge was rebuilt by Robert Russell and Joseph Elliott for just $1,494, but it was later swept away by ice. In 1884, Elias McMellen, a former Captain in the Union Army, built the 198 feet long and 15 feet wide bridge, and added it to his list of 12 other bridges he built in eastern Pennsylvania. (Mostly in Lancaster County, but I have also photographed Pool Forge, which is North of Oxford, in Caernarvon Township. In 1988 it was restored, and 20 years later in 2008 it was refurbished. Pine Grove is the longest bridge in Chester and Lancaster counties, and sits just below a waterfall that is next to the old pump-house of the Octoraro Water Company. The pump-house was built in 1904 by the Chester Water Authority, and since 1953, they have been leasing space for meeting rooms and art studios to the Charles X. Carlson Octoraro Art Association (OAA). On a personal note, this is one of the bridges that I got to photograph with my daughter, Madison. She was such a trooper, even though she was usually bored out of her mind. Since this was the first time that she had seen me at work, my running around in the water, and up and down rocks was causing her to caution me continually. It was hard to convince her that this was one of the easier bridges to photograph. I did visit the bridge this past September, but there was a lot of construction going on, and finding a place to park was difficult, so unfortunately, I did not stop. 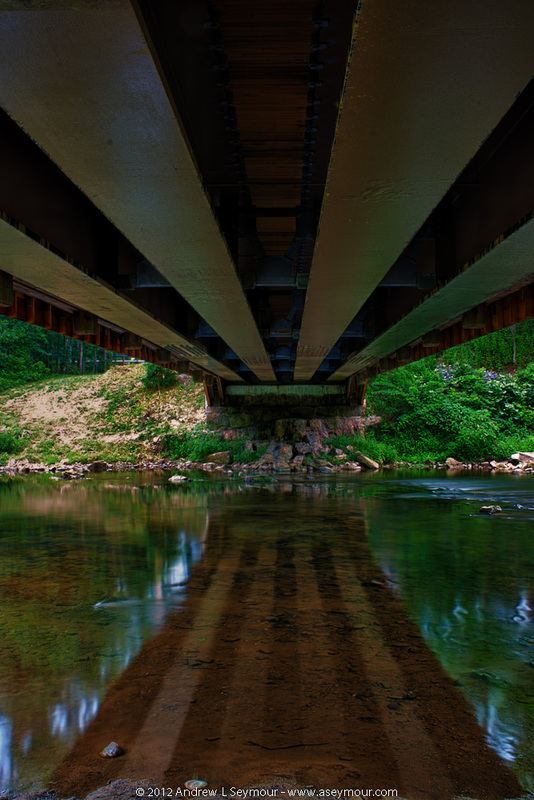 From the information that I have found, this bridge was originally just a foot bridge across Big Elk Creek. Then in 1875, an iron bridge was constructed, but only to be destroyed 9 years later in the flood of 1884. In 1886, J. Denithorne & Son’s built the 102 foot long, 15 foot wide bridge we largely see today. The bridge was named after a local landowner, who also served as the Postmaster for Hickory Hill, and ran the Post Office out of his General Store. On December 10, 1980, Linton-Stevens Covered Bridge was placed on the National Register of Historic Places. In the spring of 1996, the bridge was closed down due to damaged underpinnings during a flood, but was reopened in August 1997. To me, some of the most memorable and interesting shots from Linton Stevens, are from underneath. You see these massive, freshly painted, cream-colored girders running the full length, and then in between, colorful spray paintings of those that had visited the bridge. From 1850 to 1909, the Rudolph family, along with Charles Arthur, ran a Paper Mill up-stream with the power generated by the water. This bridge is also built across Big Elk Creek, but is further downstream than Linton Stevens, and seems to be more prone to flood damage because of this. There have been reports of flood damage in 1915, 1994, and again in 1999 with Hurricane Floyd. Rudolph and Arthur covered bridge was also listed on the National Register of Historic Places on December 10, 1980. What I really remember most about this particular bridge, was standing in the nice cool water on such a hot day. What is also different it is that if you look at the under structure, and is much darker and more visually elaborate than Linton Stevens. After returning to the bridge deck, I managed to get some detailed framework before my battery died signaling the end of the day of shooting. 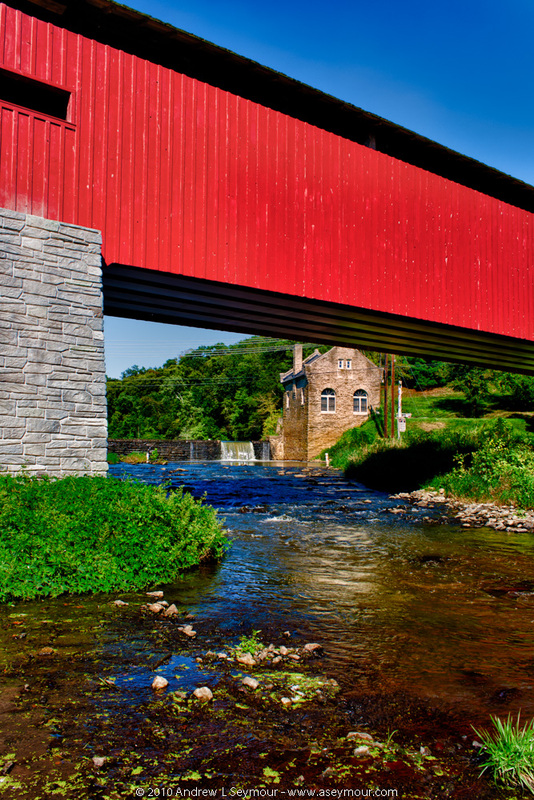 This 65 for long, 16 foot wide bridge also holds the distinction of being the Southernmost Covered Bridge in Pennsylvania, and in 1980 was listed National Register of Historic Places. I photographed Glen Hope two years ago, and I still remember my conversations with Jamie Crouse of Elkton, Maryland, as he was kind enough to stop and chat with me for some time. He and his family have lived in the area for several generations, and the stories he told me seem to roll right off his tongue, as if it was yesterday’s news. As a young boy, Jamie remembered his father telling him the story of an overloaded cement truck crashing through the floorboards in 1967, and how new Steel Stringers were added by the end of 1968. Jamie also told me the story of the arson fire that occurred during 1987. Apparently a couple of local college boys, decided to take bales of hay, put them inside a bridge, and then doused them with gasoline, and setting them on fire. He was able to point to dark indentations in the floorboards, where one can still see the outlines of where hay bales were set on fire. There was a great deal of damage to the roof, and in 1991 a significant restoration effort was completed, including the recovery of the original Bongossi wood. Bongossi wood is from Africa, and is very dark and dense and used heavily in construction and marine work. Glen Hope was the last Chester County Covered Bridge that I photographed on October 21st, 2010, nearly a year to the day of when I started with Bartram on October 23, 2009. In conclusion, the four covered bridges of the Oxford area are very unique to Chester County, and with the colors of fall starting to emerge, I encourage you and your family to take a trip to any one of these bridges and witness the beauty of the bridges and this coming fall season. There are 4 computers set up, each with a different Slide Show, that features 2 more images of each bridge, and 5 images from the rest of my Portfolio. The following links where part of the slide show that were running on four (4) different computer screens during the Open House. 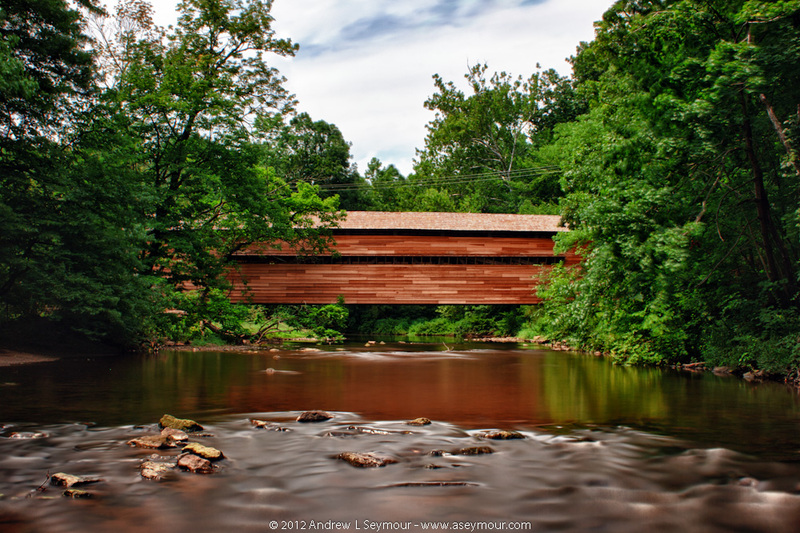 I am very happy to announce, that the very nice folks at the Citadel Bank in Oxford PA have asked me to be their featured Photographer for my series of Covered Bridges in the Oxford area! The Open House will be Thursday, October 18th from 5:30pm to 7:00pm, and light snacks and beverages will be served. I originally photographed these bridges back in 2010, and since that time, these images have only existed in electronic form, but with this Open House, I finally get to actually print some! If you are interested in attending, please let me know by October 11th! It has been very dry in Chester County for a while now, and when it did rain last night, I had thoughts of where to find some water to finally take pictures of in the area. Early in the morning, I put my photography gear in the car, along with drinks and snacks and I was off. By the time I finished my quick errands around town, it was overcast, 85°F+ with slightly high humidity, and I knew I really wanted to play with my new 10-stop neutral density filter, and I knew my first stop. The Downingtown Dam, which is just west of the center of town, along Rt. 282/Creek Road was my first stop. I parked in the little spot near the road, packed up my vest, grabbed my tripod, and was off along the little path through the woods. 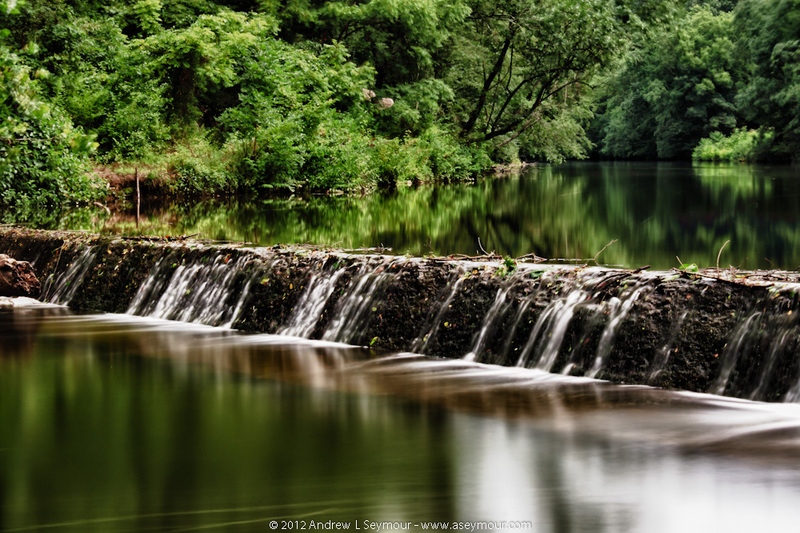 Tech Note – The Downingtown Dam image is a HDR collection of (3) three images taken at 180 sec, 120 sec and 60 sec (f22 ISO100), combined in Photoshop, with Tone Mapping done with Nik Software HDR Efex 2. I had been there a day or two earlier with my kids, when we took advantage of the swimming area just above the damn, and I also knew I could get a good measurement of what to expect further up-stream for possible later shoots. The water level was definitely higher, my guest 2-3 inches, and most of the concrete on the damn was cover, with places blocked by small branches. On the downside of the damn, it was still easy to cross the river with all the bare rocks still visible, and I quickly situated myself on the one large concrete slab near the middle. As I setup, and looked around, I knew I was not going to get much, but I pushed on with the session. During my time, I did finally get an exposure into the 4 minute range with the sun nearly right over head, but still not slow enough for somethings I want to do. After about 45 minutes of shooting, I headed back to the car, and headed further upstream. I stopped at several more places along Creek Road, checking the water levels. On several occasions, I had to deliberate, if it was worth the walk through thick poison ivy and oak, for a mediocre shoot. When I reached the west side of Glenmoore, I turned around, and headed back on a GPS drive to my next adventure. I first photographed the Sheeder-Hall Covered Bridge back in 2010, and lately, I have been reviewing my images, with a desire to try again. In Chester County, there are many wonderful, scenic roads, and Pughtown Road, off of Rt 100 (Pottstown Pike) is one of them, and along the way, one will find Hollow Road, on which Sheeder-Hall Covered Bridge can be found. The best place to park, in the little area on French Creek Road. Tech Note – A series of (5) shots ranging from 1/15th to 1 second (f25 ISO100), combined in Photoshop, with Tone Mapping done with Nik Software HDR Efex 2. Once again, I got my vest and tripod out, and headed down one of the little paths that lead to the downstream side of the bridge. I waded into the water, and took some more documentary style images, looking upstream, and then headed back to capture some more interior shoots. 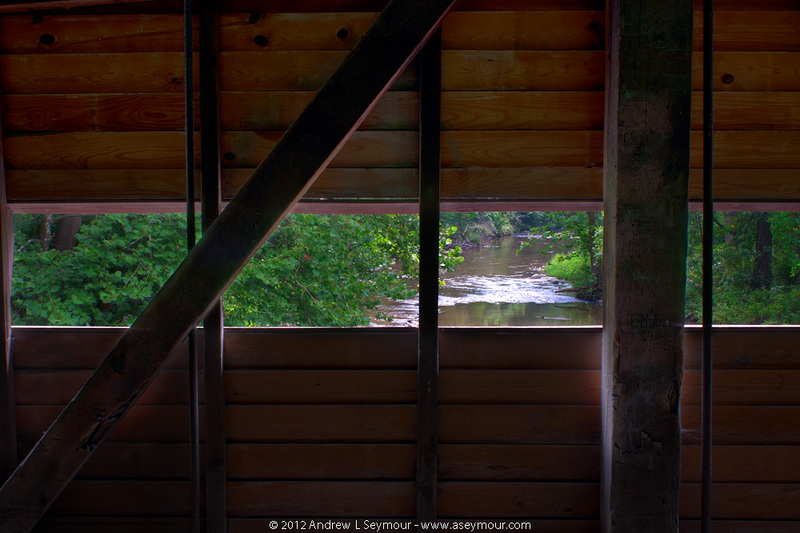 Eventually, I crossed the bridge, took some more shoots and headed back, and as I did, I turned, and saw this view. The traffic was lite, so doing the required multiple exposures for HDR work was easy, and then I was done for this session. Rapps Dam Covered Bridge in Phoenixville was another bridge that I photographed back in 2010, and since that time, Rapps has been restored, and I finally got a chance to visit to see the new construction! Tech Note – The Underneath shoot was another series of (7) HDR shoots, taken between 1 second and 60 seconds at f22 ISO100. Combined in Photoshop and tweaked with Nik Software HDR Efex 2. When one is walking near the bridge, you can still smell the fresh new wood, combined with a pitch smell as you walk underneath. Tech Note – The Underneath shoot was another series of (6) HDR shoots, taken between 8 seconds and 180 seconds at f22 ISO100. Combined in Photoshop and tweaked with Nik Software HDR Efex 2. It is very easy to see that the renovations that started on January 17 2011, were a success when the bridge reopened on Monday, November 21, 2011. PennDOT took 10 months to replace the 4 steel support beams, remove and replace the cedar roof and redwood timber and siding, along the 106-foot span. The project cost $1,527,257, which was paid for by state funds, and was managed by Bi-State Construction of Easton, PA. The last time the bridge was reconstructed was in 1978. Covered Bridge Table - List includes GPS coordinates, historical information and dimensions. If you are really a fan of Covered Bridges and Scale Models, you are going to love the work done at Mike and Jackies.